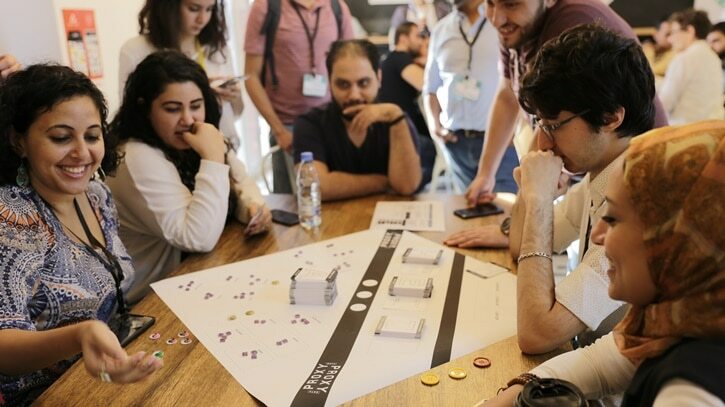 On November 20 and 21, around 200 people from over 20 countries gathered together in Beirut for 35 panels, talks, and workshops at Bread&Net, the region’s digital rights unconference. Hosted by SMEX and organized collaboratively with supporters and partners, Bread&Net created an offline space for discussion about technology and society, in a casual yet safe environment supported by the event’s code of conduct. Lawyers, policy makers, journalists, technologists, activists, and creatives led talks around different themes: policy in difficult contexts, networks and communities, culture and knowledge production online, and language and localization. With almost all sessions in Arabic, and attendees coming from across the MENA region, Bread&Net was firmly rooted in the pressing issues faced by communities in the region. People joined Bread&Net from over 20 countries. We’re also delighted that more than 50% of attendees identified as women, and that we had an even gender ratio among speakers and session hosts. Beyond the core two-day unconference, there were additional events such as a documentary screening of “The Cleaners” followed by an engaging discussion on social media platform content moderation. On the day before Bread&Net, partners 7iber and the Arab Digital Expression Foundation (ADEF) led an Editathon to launch the creation of an Arabic technical language glossary. During one of the opening panels on Day 1 of Bread&Net, ‘How to resist harsh cyber security laws,’ Lebanese Judge Hania El Helweh said, “freedom of expression is sacred… there needs to be a distinction between criticism and insult.” Yet existing and forthcoming laws were critiqued during the panel: for instance, Jordanian lawyer Omar Atout stated that the cybercrimes draft law in Jordan is “at odds with international conventions and best practices.” The application of legal frameworks also needs attention: Egyptian attorney Hassan Al Azhari highlighted that for cybercrime cases in Egypt, there is often pretrial detention without any reason being given. In the session ‘Tripartite aggression on online freedom in Palestine,’ 7amleh reported that in 2015-16, 400 people were arrested, of which 200 were ultimately charged, under the pretext of “inciting violence and terrorism” for content they had written and shared online. Wikis are BIG in MENA! Online networks offer greater freedoms, but also heightened risks, especially for some communities. At Bread&Net, LGBTIQ, feminist, and migrant worker organizers explored how online tools offered new means of collaboration and organizing in the civic space, but also led to new privacy concerns, new modes of harassment, and greater risk of surveillance. For instance, in the discussion “​Hate speech & privacy threats to the LGBTIQ community,” we learned that after a general crackdown on the LGBTIQ community in Egypt following a concert by Lebanese band Mashrou3 Leila, authorities used catfishing tactics on the dating app Grindr to identify LGBTIQ-identifying individuals. Furthermore, in countries where homosexuality is illegal, how can a member of the LGBTIQ community safely report online harassment? On a more positive note, we also learned about how mapping technologies can be used as a tool to document and advocate against harassment. This is just the beginning! Thank you to everyone who came and made Bread&Net such a huge success. A special thank you to the Advisory Committee and our partners. We hope to see more regional voices at global conferences like the Internet Freedom Festival (IFF) in Valencia and RightsCon in Tunis. Stay tuned for Bread&Net 2.0!